Exhibition Displays :: Portable Pop up Displays | Pop-up Display Stand | Backdrop Wall Display Stands | Popup Banners | BUY DIRECT AND SAVE. Freestanding stainless steel carousel stand. 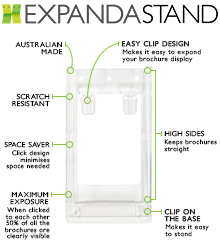 Holds A5 Expanda brochure holders. Displays brochures on all three sides. Designed to display your brochures in portrait format. A header card can be purchased and inserted on the top for branding. Kit comprises of the following items: Stainless steel base and pole. 3 plastic 315 wide spinners for A5. 3 plastic moulded collars to hold spinners in place. All brochure holders made from clear high impact polystyrene. Copyright © 2018 Display Master Australia Pty Ltd. All Rights Reserved.